Blowout Sale! Free Shipping Included! Save 75% on the 1X/3X Magnification Led Cosmetic Mirror Wall Mounted, Double Side, Adjustable, Rotating Function, Lighted Vanity Mirror, Powered by 4 x AAA Batteries (not Included) by FIRMLOC at Baharta. Hurry! Limited time offer. Offer valid only while supplies last. 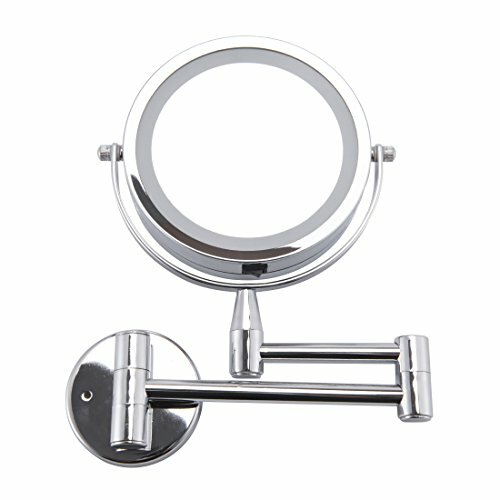 - Wall mounted mirror with 11-inch extendable arms and chrome finish. - Double-side 1X/3X circular mirror features a smooth 360-degree swivel design. - Wall mounted mirror with 11-inch extendable arms and chrome finish. - Double-side 1X/3X circular mirror features a smooth 360-degree swivel design. - High quality materials protect against moisture and condensation. - Led lights last longer and use less electricity than all other types of lighting. - Magnification options and clear images make sure every detail of your hair and makeup are in place. 1.Check the mounting hardware before discarding any package. 2.Position the item on wall in desired location. Make sure that it is level, and mark the location of fasteners bracket with a pencil on the wall. 3.If the wall is made of wood, just fasten mirror with screws, ensure keeping level. a.Drill the wall with a impact drill. Be careful not to break the tile. b.Hit the expansion pipe into the wall with a hammer. c.Align holes of mirror's base to pile hole position, then tighten set screws to firm the mirror. The external housing for the two mirror faces is divided in the middle. 1.Grasp the two mirror faces along the edges and twist the mirror housing for each face in opposite direction - about a half-inch. 2.One mirror housing will slide to the "unlocked" position. Pull the mirror faces apart to reveal the battery compartment. 3.To reassemble, line up the dimples in the exterior circumference of the mirror housings, push up the housings together and twist. We are dedicated to providing quality products and services to satisfy all customers. If you truly feel you're not happy with your purchase, we promise to replace or refund every last penny within 30 days of receipt of the products. Just contact us without hesitation. 3X / 1X MAGNIFICATION & 360° ROTATING: This makeup mirror features 3X magnification and 1:1 with smooth 360-degree swivel design. The standard 1X side for a great view of your overall look. The 3X for letting you check every detail of your skin or makeup. 11" EXTENDABLE ARM: 2 adjustable arms allow a free rotating in 360-degree horizontal direction. Also it can be adjusted to any positions you need. Various angle options make your application process simple. EASY INSTALL: The wall mounted mirror can be installed firmly just with few accessories. It is available for hotels, bedrooms, bathrooms, dressing room and as a gift for ladies. If you have any questions about this product by FIRMLOC, contact us by completing and submitting the form below. If you are looking for a specif part number, please include it with your message.